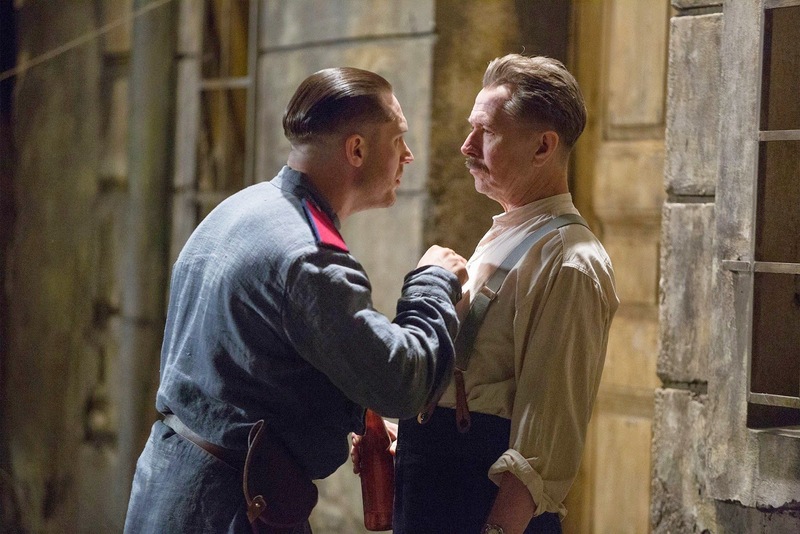 Child 44 is a movie that seems to want to be one thing, but doesn't know how to be that thing. It has ideas of how to be this grand period piece/spy thriller yet it isn't sure how to convey the inherently intriguing story it is dealing with. There aren't necessarily too many facets occurring or even a lack of focus, it's simply put: a script issue in that the gripping story wasn't told in the most gripping of ways. It is actually somewhat impressive that what was seemingly used as the shooting script was able to make it to that stage in the first place. If the film I saw was taken directly from the screenplay, and it's highly unlikely there was any improv on this set, then one would imagine it would come to light pretty obviously that there were some major structural problems that needed to be reassessed. Instead, director Daniel Espinosa (Safe House) and his exceptionally talented cast drift through this somber and distinctly cold film without seeming to notice that the pieces weren't congruent. There could be any number of reasons Espinosa and his crew didn't take note of these shortcomings while in the midst of shooting as I imagine there is a great pressure to get things done in a certain amount of time and under budget, but while something should have come of this in the editing room (where many directors admit the a film is truly made) the major issues still come back around to point their fingers at the script. Based on what the final product delivered this was more like the second draft of a screenplay rather than one further down the road, one that was able to find its voice and emphasis on particular themes. Adapted from a novel by Tom Rob Smith and written for the screen by Richard Price (who hasn't written a feature since 2006 and has tellingly worked more in television) the editors were unable to craft a slimmer film from the footage that was shot because each moment admittedly relies on a detail in the previous scene to move forward despite the two halves of the film feeling completely disconnected. 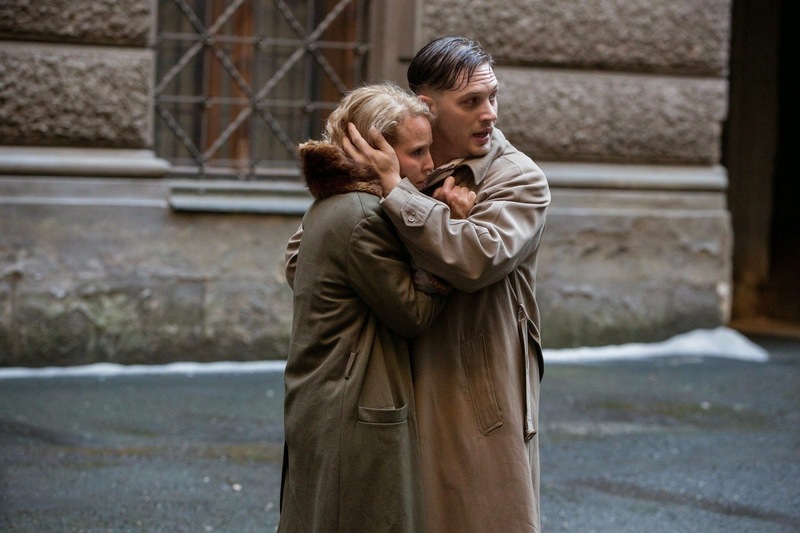 Raisa (Noomi Rapace) and Leo Demidov (Tom Hardy) face a crisis of conscience in Child 44. What is most disappointing about this lack of harmony within the film is the clear potential it had to be something rather significant. While Safe House was a perfectly serviceable little action film that offered nothing substantial, but was at least entertaining I held some kind of mentality that Safe House was the film Espinosa used to get his foot in the door while Child 44 might be some kind of passion project that he used his new found clout to get made. I thought this good on him and that instead of using his success to garner directing gigs in cinematic universes or other brand-based movies that were surefire hits no matter who directed them that he would instead put his efforts toward a genuine adult drama. The kinds of movies Hollywood supposedly doesn't make anymore. In going in with this type of mentality and seeing the cast Espinosa had assembled in Tom Hardy, Noomi Rapace, Joel Kinnaman, Jason Clarke and Gary Oldman not to mention supporting bits by Vincent Cassell and Paddy Considine it seemed there was no way this could be anything beyond solid as a cast as collectively strong as this wouldn't all sign up for material they felt wasn't worth their time. What each of them saw in this material must not have transferred to the screen though because for all it does to try and be a serious and thoughtful piece of history it never feels as if it knows enough about that history to really commit to it. While I firmly believe the majority of the issues with the film come from the ability to craft and leaner, more decisive script it is also clear that as the film plays out there is a sense of clumsiness to the direction. This feeling tells of how Espinosa didn't really grasp the story (or the history) as a whole and as a result delivers a movie that not only feels patched together in its story, but in its shot construction and sense of location and purpose. There is ultimately no connection to the audience and in that the movie fails in making us care ninety-five percent of the time, only coming to be even remotely effective when it resorts to shocking brutality. 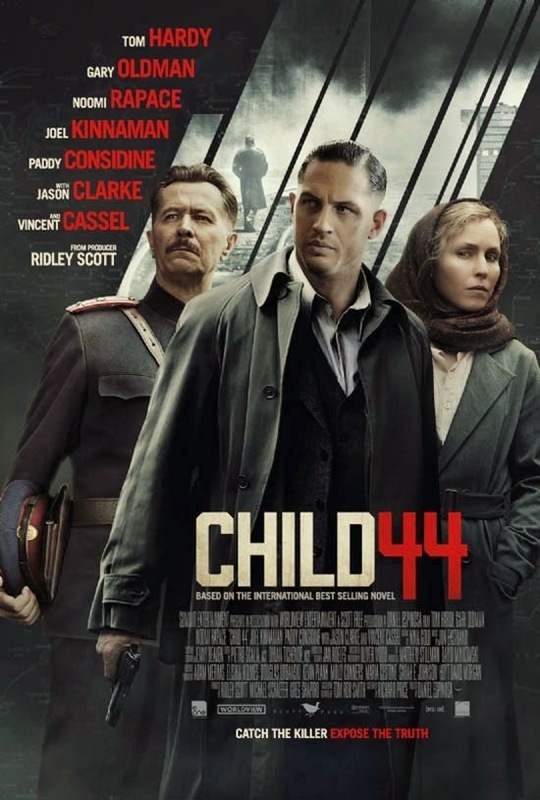 If you saw the trailers for the film you might wonder where I'm coming from, but that is because the trailers for Child 44 portray a completely different film than what we see in the final product. As far as the marketing material is concerned this is a film strictly about a mysterious child murderer that directly connects himself with an officer in the Moscow police force and leads to the investigation of how this single murder may connect to a larger string of child deaths that account for a total of, you guessed it, forty-four. Seeing as Moscow was under the rule of Stalin in the early fifties and for reasons not touched on in the film they continually refer to a rule of thumb that "there is no crime in paradise." Under this rule the entire police force intends to cover up any such crime, especially murder, while trusting in tests of blind obedience among their own should they or their families be involved in such a crime. The issue is, the film doesn't really get into any of this until we're about an hour into it. Sure, there is a bit of slight foreshadowing as far as character emotions are concerned, but little more than this and it's still done in a fashion that could have been done more successfully. Before introducing any of these factors though we are witness to the exposition of the century that establishes not only who Leo Demidov (Hardy) is, but how he came to be this high-ranking member of the military police. We are witness to the love he has for his wife, Raisa (Rapace), who seems more dissonant to her husband than anything else as well as how Demidov conducts himself in his duties. Credit to Hardy for creating a rather complicated character in that he is multi-faceted, but it mostly goes to waste. We are unsure how to classify Demidov initially, but come to see many sides of the man as he tries to navigate how to both live by what he is led to believe is right while that moral compass begins to stray from that of his employers. He is asked to denounce his wife after she is suspected of being a traitor, but does not and thus loses his status, power, home and in return is exiled to a provincial outpost. It is here that Leo and Raisa join forces with General Mikhail Nesterov (Oldman) to track down the serial killer who preys on young boys. Leo makes his intentions of catching a child murderer very clear to General Nesterov (Gary Oldman). In the end, I still don't know that I'm exactly sure what to think of Child 44. It is a movie, it exists, it isn't exactly horrible and even has some strong aspects to it, but does little to either move or impact me beyond making me aware of this part of Russian history. There are nuggets of ideas here, planted early on-such as to what extent is the greater cause worth the sacrifice of ones only personal life they might ever be afforded or what real good comes from fear? That there is no real respect earned and no loyalty inspired, so what do people like Cassel's Major Kuzmin or Kinnaman's Vasili think they will accomplish by exercising such methods? Kinnaman's character is especially interesting not only by virtue of the fact I haven't seen the actor in this kind of role before, but because he craves a significance and importance that he almost expects without having to do anything to earn. Both veteran actors in Cassel and Oldman are more footnotes than anything else here despite, again, the trailers making it seem as if Oldman would be a major player. As we get into the second half of the film though, where Oldman is introduced and becomes slightly more prominent, the film takes a turn to what I expected it to be all along. I'm not upset the film didn't meet my expectations from the get-go, but more that it didn't know how to convey the necessary layers of this story as a whole. The film decidedly feels like two separate stories featuring the same characters so when it shifts its focus in the middle of the second act it is unable to build on a culmination of all the details that came before it to deliver a satisfying conclusion. How does one have an anticlimactic climax? Well, in the case of Child 44 it is done by forcing it. Price and Espinosa didn't need another brutal brawl to cap off what was already an underdeveloped character that is painted as the prime antagonist, but is hardly the guy we hate the most in the film. Rather, it might have been more enlightening to have a matching of wits between Leo and our villain that exemplified the major themes the film intended to portray, but instead of a swift kill with words we are given a blunt stopping point that is as clumsily cluttered as everything that came before it.